Olodum is a bloco-afro from Salvador's carnival, in Bahia, Brazil. It was founded on April 25, 1979 during the carnival season as a leisure option for residents of Maciel-Pelourinho, guaranteeing them the right to play at the carnival in one block and in an organized manner. It is a non-governmental organization of the Brazilian black movement. Its headquarters are located in the historic center of Salvador, Pelourinho, which hosts most of its presentations. Its CEO is João Jorge Rodrigues. Olodum develops activism to combat social discrimination, boost the self-esteem and pride of Afro-Brazilians, and defend and fight to secure civil and human rights for marginalized people in Bahia and Brazil. Currently[when? ], it has a social project called Escola Olodum (Olodum School). Founded as an African block of the carnival in Salvador in 1979, Olodum is currently a cultural group considered a non-governmental organization. After their first run in 1980’s carnival, the band acquired almost two thousand associates and began to talk about historic themes about African and Brazilian culture. The band’s first LP was called “Egito, Madagascar” and was recorded in 1987, and became famous with the song “Faraó, Divindade do Egito”. The idea of this LP was to honor the roots of the group and show to the country "Mamma Africa," and to show, too, how the group was born (from the drums to the influences of African Gods). Just after, Olodum started to be known in the entire world as an African-Brazilian percussive group and performed in Europe, Japan, and almost all of South America. In 1988, Simone recorded “Me ama mô” live, in Pelourinho, featuring Neguinho do Samba and Olodum (this record is in Simone’s album, "Simone"). In 1991, Olodum performed at Paul Simon's Concert in the Park after they had worked on Simons 1990 album The Rhythm of the Saints. One of the biggest moments for the group was in 1996, when they participated in the Michael Jackson song, “They Don't Really Care About Us” from the album HIStory: Past, Present and Future, Book I, and the video clip was recorded in Pelourinho and Jackson also collaborated with the 200 members of the cultural group Olodum, who played music in the video. The media interest surrounding the music video exposed Olodum to 140 countries around the world. It brought them worldwide fame and increased their credibility in Brazil. Lúcia Nagib, of The New Brazilian Cinema, said of the music video:. After this, Olodum recorded with famous artists from Brazil and abroad, such as Wayne Shorter, Jimmy Cliff, Herbie Hancock, and Caetano Veloso. In 1996, the band appeared in Heavy Metal band Sepultura's album "Roots." In 2013, the band played live with Kimbra on Rock in Rio's sunset stage, performing a cover of "They Don't Care About Us." Beyond that, they participated in the official song, consequently in the opening, of the FIFA World Cup 2014, with rapper Pitbull and singers Jennifer Lopez and Claudia Leitte. Parallel to the artistic success, the band takes part in social movements against racism and for civil and human rights. On June 13, 2011, Olodum’s ex-voccalist and songwriter Germano Meneghel, author of hits like "Avisa lá," "Vem, Meu Amor," "Alegria Geral," and the posthumous "Várias Queixas," was found dead in his home. The causes of death are still unknown. Samba-Reggae is a music genre born in Bahia, Brazil. As the name suggests, it was originally derived from a blend of Brazilian Samba with Caribbean Reggae. It arose in the context of the black pride movement that occurred in the city of Salvador de Bahia, around the 1970s, and it still carries connotations of ethnic identity and pride for Afro-Brazilians today. Bahia's population has a large proportion of dark-skinned Brazilians who are descendants of African slaves who were brought to Brazil by the Portuguese in the 18th and 19th centuries. These Afro-Brazilians played a major role in the early development of samba, which first took form in a Bahian style of dance and music called "samba de roda”. 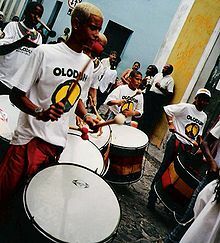 Samba de roda was brought to Rio de Janeiro by Bahians around 1900, where it was combined with harmonic and rhythmic elements from European influences (such as chorinho and military marches). By the 1930s, samba de roda had developed into the faster, more harmonically complex Rio-style samba that is now played in Rio's Carnival. Samba-reggae represents an effort by black Brazilians to develop a Carnival parade music that they could call their own, and to form all-black or mostly-black blocos with which they could parade during Carnival. The afro bloco music was very different because they aimed to recreate and strengthen their community through their music. Olodum is undoubtedly the most famous musical act performing samba-reggae in Brazil. Bando de Teatro Olodum (in English, Olodum Theater Band) is a theater group created by black actors in 1990. Eventually the Bando de Teatro Olodum took up residence at Teatro Vila Velha. Thanks to the occupation of Bando, the space was revitalized, and in 1994, began to be renovated, and in 1998 reopened. The Bando is the Teatro Vila Velha today and has featured big names like Lázaro Ramos, for example. Focused on Brazilian black issues in its various aspects, O Bando (in English, The Pack), as it is more commonly called, develops its own language in one of Experimental Black Theatre format. Since October 25, 1984, the Escola Olodum (in English, Olodum School) is a real space for participation and expression of African descent community, becoming a national and international reference for innovation in working with art, education and cultural diversity. The Escola Olodum reveals magnitudes beyond the touch of the drum, with activities that aim to enhance the potential of children, adolescents and young people through languages that enable social and digital inclusion, working alongside the issue of ethnic and cultural citizenship. This pioneering project of Brazilian African popular education originated in the Rufar dos Tambores project, developed in 1984 by Olodum, composed of free classes of African block percussion, and African courses - Brazilian short-lived. Initially aimed to answer a request Maciel / Pelourinho community to be formed an integrated percussion band for children and adolescents of the neighborhood, but currently has students from throughout the city of Salvador. It offers percussion courses (theory and practice), popular song (theory and practice) and African dance. Entries are made annually for children and adolescents aged 7 to 14 years.